What you see is a stamped image, heat embossed and some colouring with Promarkers. Not sure where I am going with it when the colouring is finished, I will get to that later. Well that's me today folks, if you would like to see some more active desks, visit the wonderful Julia by clicking on the WOYWW button on the right hand side. Morning, Chris. Lovely image there - that will look great whatever you do with it to mount it. Hope the BBQ went well last night. We had nearly 30 for supper here - all dying to see the "new feature"!! I think some of the best crafting is done when you don't start out with a specific idea in mind! Just enjoy it, something will turn up! Oh Christmas! I do so need to get started. It's so hard when it's 90 degrees outside and so very humid as well. Your cards will be just gorgeous I'm sure! I always want to get started on my Christmas projects early, but it never happens. Are those die cuts? Now that is a truly beautiful stamp..... I am just going to hide in a crafty corner and pretend I have lots of time till Xmas. How lovely to be able to make a start on your C cards. If it was not so hot I would make a C Cake as I just feel a rich fruit cake or two would fulfill a gap at Christmas. I have been doing a Christmas project though I cannot tell you what it is or post it at the moment, it feels really strange and to be honest i don't normally make anything for Christmas until at leat October so well done you Lol! These will be gorgeous when they are finished! 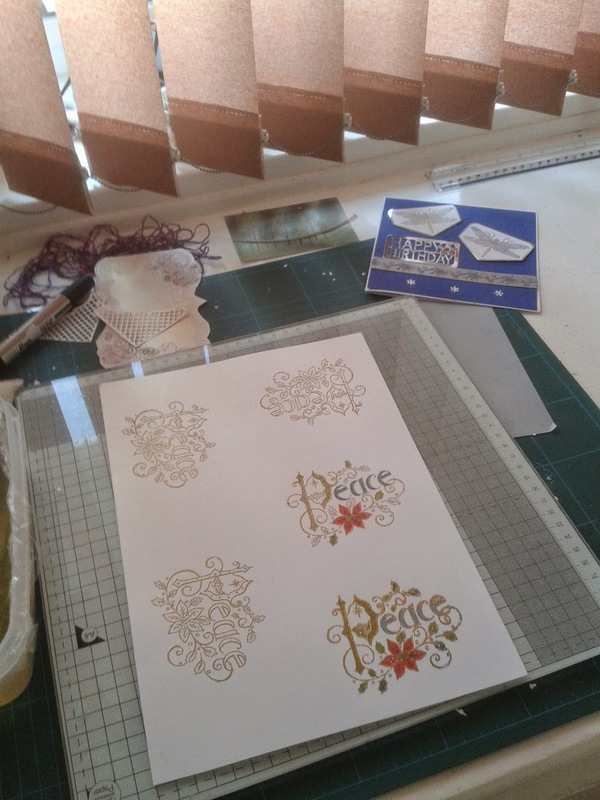 Love gold embossing powder.